Although an unlikely and unconventional ingredient, cornstarch helps to ensure a crispy crust on fried chicken that does not fall off. The coating may not be what you expect, however, as it is closely resembles a heavy tempura batter. Most Chinese recipes that call for frying chicken use cornstarch in the recipe, so cut your chicken into bite-size pieces before frying and add it to a simple vegetable stir-fry for a flavorful and satisfying main dish. Remember that deep-fried food is a diet-buster, so only consume fried chicken in moderation. Mix the buttermilk and egg together in a medium bowl. Add the chicken pieces to the bowl, making sure to immerse each piece in the liquid. Refrigerate the bowl for 1 hour. Combine the flour, cornstarch and seasonings in a shallow bowl or resealable plastic bag, and coat the chicken pieces with the mixture, one piece at a time. Place the coated chicken on a platter and refrigerate it until the flour absorbs the moisture and becomes doughy. Fill an electric deep fryer with cooking oil, or pour several inches of it into a large, heavy-bottomed pot. Heat the oil to between 350 F and 375 F.
Place the chicken in the oil in small batches and fry for 5 to 10 minutes, depending on the size of the chicken pieces, or until the chicken is golden brown. Place the fried chicken on paper towels or a rack to drain while cooking the remaining chicken. 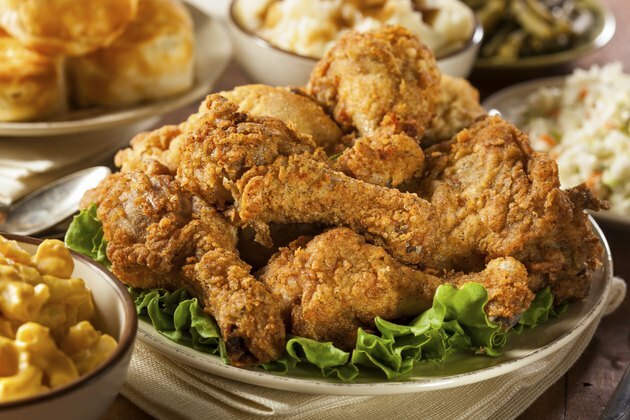 Put your personal mark on the fried chicken by experimenting with different combinations of seasonings. Southern cooking diva and celebrity chef Paula Deen adds a touch of hot sauce to her liquid mixture, while Alton Brown relies on cayenne pepper to give his fried chicken a kick. Avoid overcrowding the pot or fryer. If you attempt to cook too much chicken at one time, the temperature could become lower than 350 F, which could result in very greasy chicken. Use an instant-read thermometer before cooking your second batch of chicken to ensure that your timing was right and the chicken is cooked through. The U.S. Department of Agriculture’s Food Safety and Inspection Service cautions that you should cook chicken to a minimum internal temperature of 165 F to minimize the risk of food-borne illness.